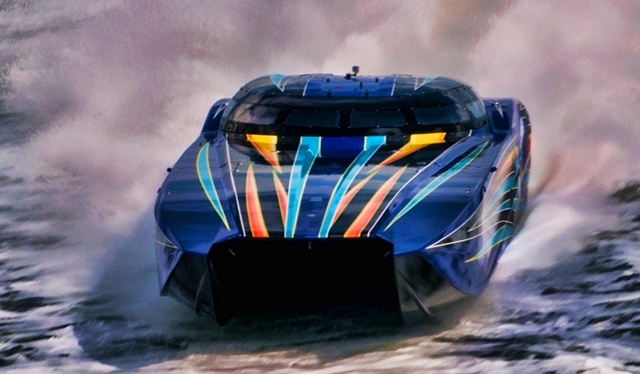 They may not be “green,” but these gas-guzzling powerboats are one heck of a lot of fun. Everyone’s always yapping about environmentally-friendly powerboats, like the Greenline 40, the SWATH Electra Glide, or the Carolina Electric Boats Twin Troller. Don’t get us wrong, we respect the direction these boats are taking, but that doesn’t mean gas-guzzlers have no place in the modern boating world. In fact, if you want to go outrageously fast, take a luxurious condo with you when you leave the dock, or fish with the big dogs, you’re going to be spending a lot of time at the fuel docks. And let’s get a reality-check here, fellow boaters—virtually all powerboats bigger than runabouts could be considered "gas-guzzlers" to one degree or another. But if you are ready to convert that dinosaur juice into explosive power, take a look at these three exceedingly cool but atrociously thirsty powerboats. Want to go fast? Really, really fast? The MTI 52 is ready to oblige. 1. MTI 52 Canopied Cat – If you want to go fast—really, really fast—there’s no substitute for raw horsepower. The MTI 52 runs on a pair of twin Mercury Racing 1650’s (other options are available) to hit speeds in excess of 180 MPH. Nine liters of displacement and 6200 RPM add up to a lot of internal combustion, but no one (including Mercury Racing) seems willing to publish official fuel consumption figures. However, considering that the 1350s burn around 120 GPH at wide-open, it’s a fair bet that the 1650s burn, well, more than that. And there are two of them, so we can figure that your hourly burn at top-end will be somewhere between 250 and 300 GPH. Does that qualify as a guzzler? You bet. Note that these powerplants run on 112-octane fuel, only, and come with no warranty whatsoever. Still, there’s a thrill that comes with going this fast that simply can’t be matched by other on-the-water activities. Besides, if you’re enough of an adrenaline junky speed freak to buy a boat like this, you probably won’t care that the MTI’s green factor is somewhere between a coal-burning powerplant and a battleship. 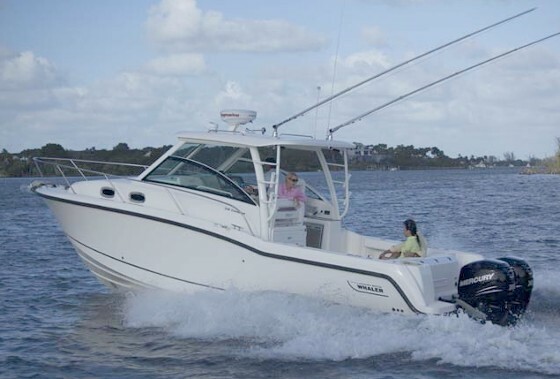 Want to check out some MTI powercats that are on the market right now? See these current MTI listings. The Spencer 70: have fuel, will fish. 2. Spencer 70 – What happens when you put triple 900 HP engines into a sportfishing yacht that weighs 83,000 pounds? Yup, you guessed it: lots of fuel gets burned. The Spencer gets a whopping 0.3 miles to the gallon, when roaring to the fishing hot-spots at about 44 MPH. 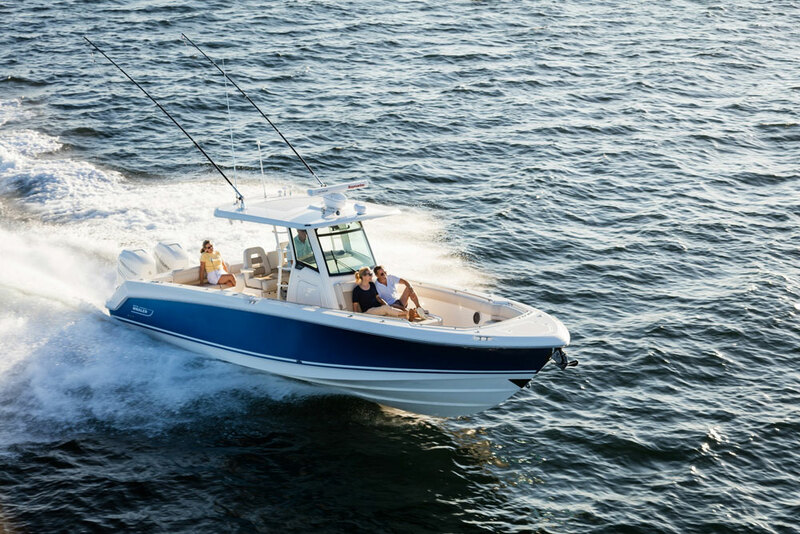 And believe it or not, this is a slight improvement over older sportfishers in this size range, which often get more like 0.2 miles to the gallon at WOT. The solution to such a monstrous fuel burn is, naturally, a gigantic fuel tank. And the 70 holds an outrageous 1,380 gallons. To put it into perspective, that’s more fuel than the average boater goes through in an entire season of boating. It’s enough fuel to produce about 8,500 kilowatt-hours of electricity with a portable generator. And it’s about the same amount of fuel a diesel-powered train uses to move one ton of freight 662,400 miles. Beyond the burn, there’s an awful lot to love about this boat. Its interior is, in every way, superyacht-quality. Upholstery is leather, the sole is white oak, countertops are granite, and there are over 70 recessed overhead lights in the overhead. Fishermen will love it, too, because despite the Trump-level interior, the cockpit is all blood-and-guts. 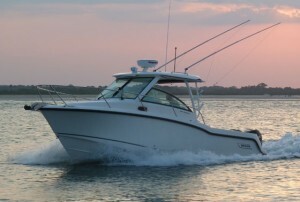 It features a transom fishbox/livewell, an onboard bait freezer, four tuna tubes, and a fighting chair on a 20” offset. Want to be king of the fishing fleet, fuel burn be damned? Then check out these Spencer listings. Quadruple outboards? You've gotta pay to play. 3. 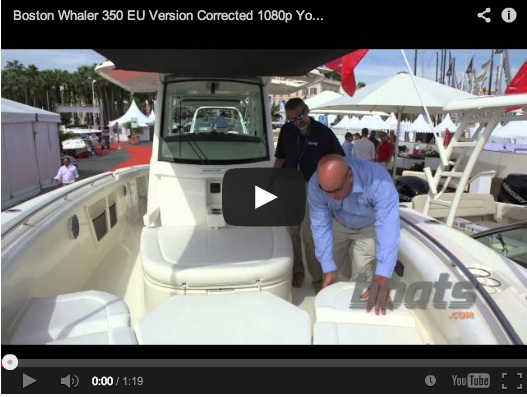 Boston Whaler 420 Outrage – Don’t get us wrong, we love this boat. But truth be told, the fuel burn is, well, outrageous. 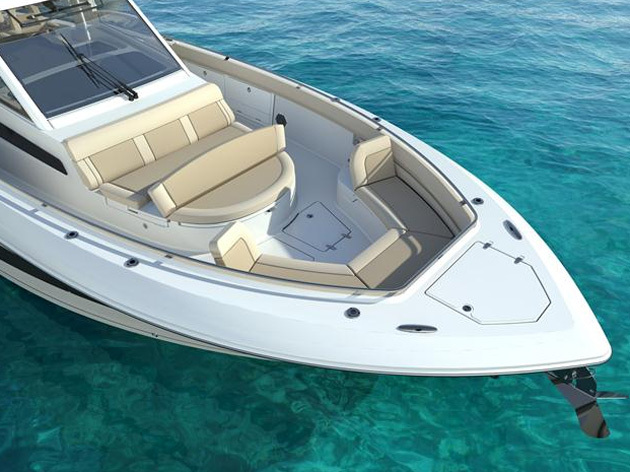 The 420 Outrage boasts quad 350 HP Mercury Verados. Yes, these engines are quite modern and efficient four-strokes. But when you put four of them together and unleash the ponies, all together they’ll chew through over 120 GPH. That’s a lot of gasoline. The 420 does move along at quite a nice pace, thanks to all of that internal combustion. Even fully loaded it’ll break 50 MPH, and at a more reasonable cruise of 35 MPH the boat gets around 0.7 miles to the gallon. 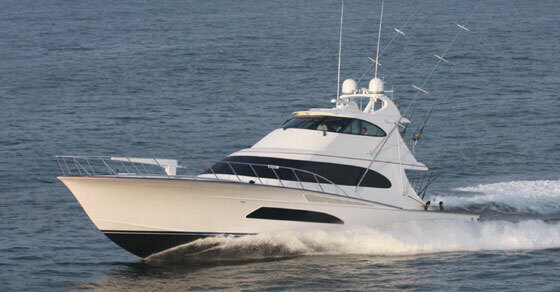 That may sound pretty bad to a landlubber, but we boaters know that for a 42-footer that actually isn’t bad. Plus, this Whaler is unlike any we’ve seen before. 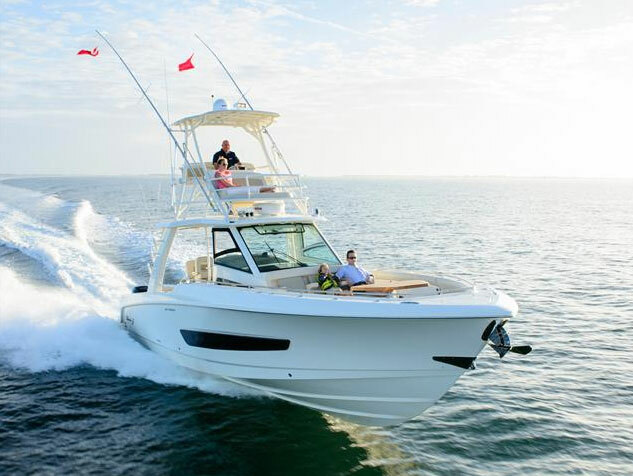 In all truth it’s more of a yacht than a center console, and while it’s certainly fish-able, it has entertaining perks like a bow cockpit with seating and sun lounges, two-row stadium seating on the helm-deck, and a console cabin that befits a cruiser. 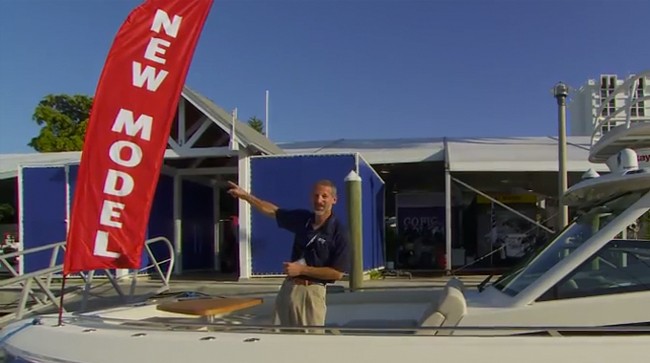 In fact, the cabin has seven feet of headroom, a settee and dinette, a full galley, a 26” flat-screen TV, a fully enclosed stand-up head, 16,000 BTU air conditioning, and even a central vacuum. All standard. Want to find out more about what's available in this model? 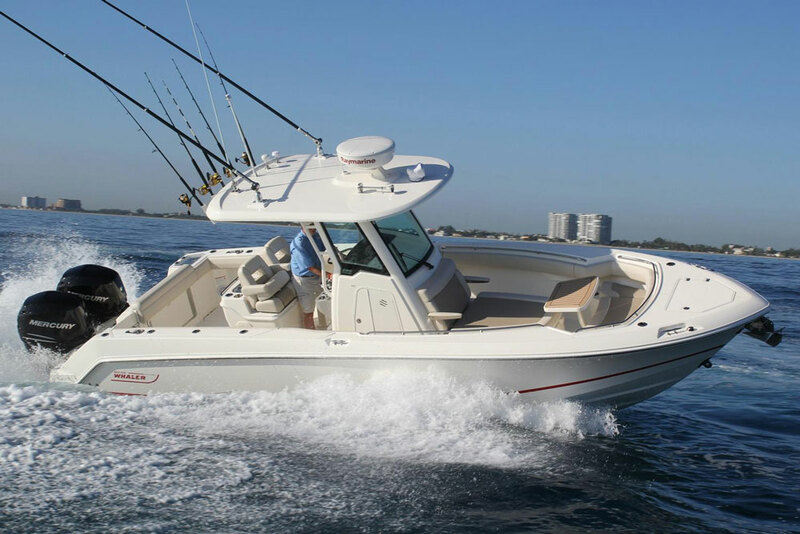 Here are some Boston Whaler 420 Outrage listings. Does all this talk of increased carbon footprints leave you feeling a bit queasy? In that case, you might be interested in reading Alternative Power: Outboards that are Gasoline Free. Or take a look at Fuel Saving Tips for Boaters. That should help assuage your environmental conscience.